Famed media personality Charlamagne Tha God joins Larry for a no-hold-barred discussion about America's current political climate, Tomi Lahren's departure from 'TheBlaze,' and the future of his hit show 'The Breakfast Club.' Plus, the fan-favorite host details his new book 'Black Privilege: Opportunity Comes to Those Who Create It'. Larry King interviews Charlamagne tha God, host of the popular radio show ‘The Breakfast Club’ and of MTV2’s ‘Uncommon Sense.’ He is also the author of ‘Black Privilege: Opportunity Comes to Those Who Create It.’ Known as “The Howard Stern of Hip-Hop,” Charlamagne tells King that he’s always evolving and doesn’t want to place labels on himself. King comments that Charlamagne’s not afraid to ask tough questions, and Charlamagne describes his interview style as a conversation without an agenda. They talk about some of their interviewees and experiences. Then King asks about Charlamagne’s experience with the 2016 presidential election. Charlamagne says disappointment is an understatement, and that he believes Trump’s administration will crash and burn, since Trump is not qualified. King asks for Charlamagne’s thoughts on Hillary as president, and Charlamagne believes she would’ve been a great president who could’ve made the White House a White Home. From politics, King transitions to Charlamagne’s personal journey, and asks how he got into radio. Charlamagne had been working odd jobs to get out of street life, and was inspired by a radio personality to get an internship at a station. He describes it as the most accomplished thing he had done at the time, and his show became popular since he didn’t have experience and simply behaved like himself. Keeping with these career questions, King asks about Charlamagne’s book, ‘Black Privilege.’ Charlamagne talks about how his mother was an English teacher and he used literature and hip-hop to imagine other worlds. He wanted to share his life principles in a self-help book to spark something in others, and especially wanted to advocate the divine privilege of being alive, and finding power in that. King asks Charlamagne about his keys to success, and Charlamagne talks about living your truth and how everything is a process. Switching briefly back to politics, King asks Charlamagne if he would interview Trump. Charlamagne believes Trump should talk to policy makers who can help him improve the country. King asks if Charlamagne is looking forward to any campaigners in 2020, and Charlamagne names Cory Booker and Elizabeth Warren. 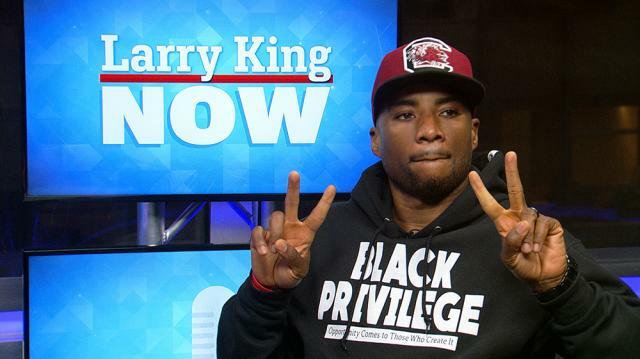 With this long-term perspective, King asks Charlamagne how long ‘The Breakfast Club’ will stay on. Charlamagne doesn’t know, but he hopes it will be a lengthy run.